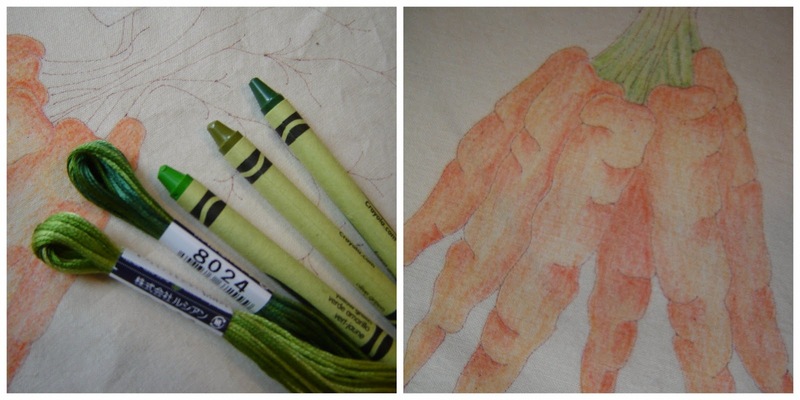 My new favorite thing - embroidery with color crayon tinting! 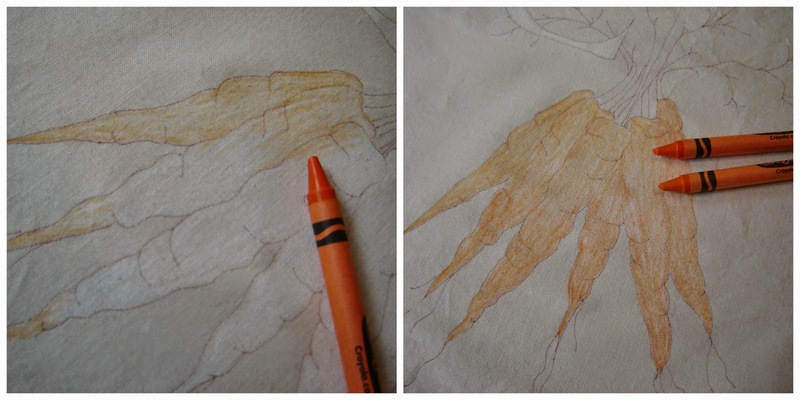 I've put together a little step-by-step of how to color your fabric before you embroider. I hope you find it helpful! I'm taking a class on this gorgeous quilt - A Gardener's Alphabet from Crabapple Hill. Each block is color tinted, and today I'm working on Block C.
Whenever coloring your stitchery fabric with crayon, step one is to wash and dry your fabrics without using any softener. Press your fabric. Now tape your pattern to a light box or a sunny window, and use a fine-tip Pigma pen to trace out the pattern. Avoid water- or air-erasable pens as these can be permanently set into your fabric when you heat-set the color later on. Prepare a clean, smooth surface on which to color. Trim away loose threads, and give yourself ample space. Tint everything that you will color in WHITE. This fills in those little fabric pores and gives you a nice base over which to color. Next, pull out the crayons and embroidery floss that you'll be using in order to decide on colors ahead of time. The pattern tells you which colors to use so make sure you have those handy and that you like the combination. Don't be afraid to change it up! 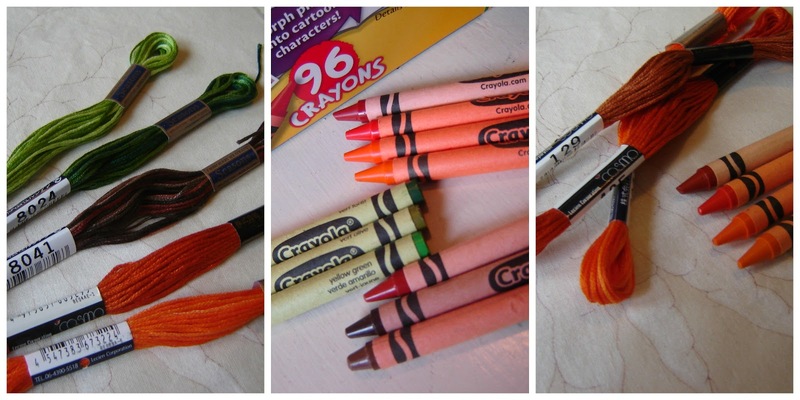 Here I pulled out the floss and the crayons, and then I put them together to make sure I liked the pattern's suggestions. I did! Experiment, experiment, experiment. Always have a scrap of your background fabric on hand to play with before coloring your actual block. Begin with your lightest shade of crayon, and get darker as you go. You can always go darker, but it's pretty hard to go lighter! I color everything in - sort of a second "base" of color - before I begin to shade. And you can always leave some parts white. Where light hits an object, it often looks white. Remember - you can always darken it in later on! Next come the greens, and I just followed the same process, going light to dark. I colored in the Letter C as the pattern suggested, and my coloring was complete! Now it's time to heat set. 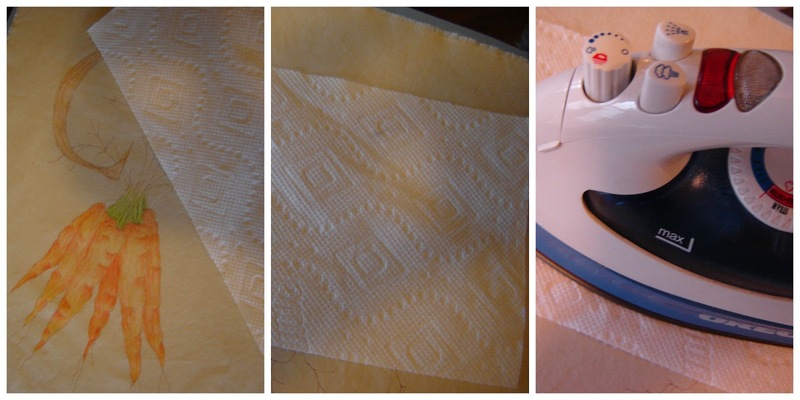 Place a clean paper towel over your project, and press with a hot iron, without using steam. Lift up the towel, and if it's completely free of crayon, your done! If not, repeat with a clean towel until the towel comes back clean. Now here's the block after heat setting. The heat helps to smooth the color, giving it a nice finished look. 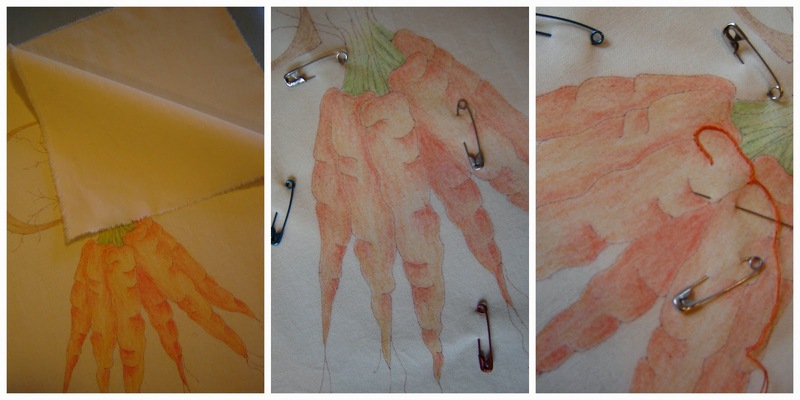 Now layer your stitchery over a background piece of muslin (also pre-washed); baste; and embroider! So what do you think? Not too hard, right? Everyone's block will look different, and that's the best part of being creative. Hope you have fun, and contact me anytime with questions, comments, ideas... I'd love to hear from you!